Fall will quickly be upon us and with it the fall harvest. That means that it’s time to reach for a freshly picked apple, time to break out the scarecrows, and time to start setting up those Fall Harvest Tablescapes with yummy treats featuring new M&M’s® Pecan Pie flavored candies. It’s also about time to pull that mixer for baking season. If you are needing a new one, keep reading for your chance to win. A beautiful fall tablescape is actually simpler to put together than you might think. Just think about what fall means to you. For me, it means, pumpkins, gourds, mums, and leaves of maroon and orange, all the makings of a classic fall outing. First, I grab a runner that fits my color scheme and top it with my largest items. In this case, it’s raised trays for the cupcakes and a box for my flowers. Next, I place my larger decorative items and my flowers. Then I fill in with smaller gourds and leaves (these can be real or artificial). Finally, I put out my food. Once you have your tablescape together, it’s time to get thinking about the food that you are going to serve. Since it’s baking season, you will need a mixer and now you have a great chance to win one! 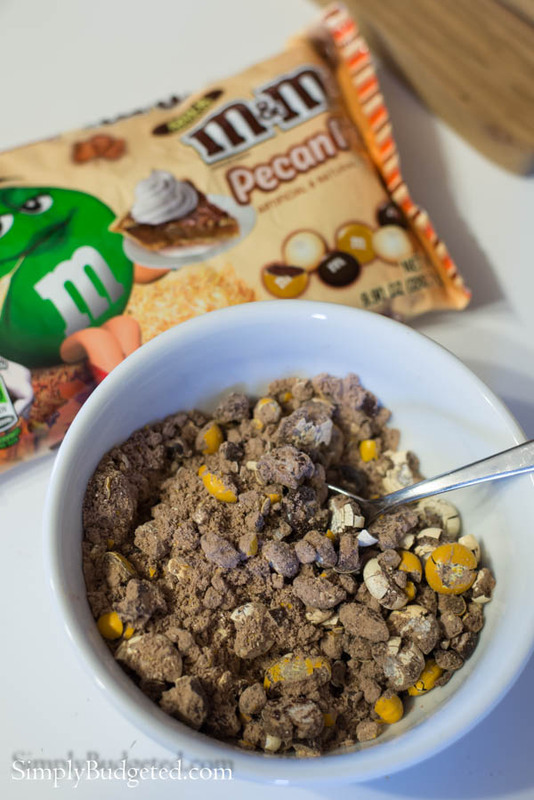 The food, of course, has to fit with the theme and M&M’s® Pecan Pie flavored candies make it too easy! I start by making some Pecan Pie Popcorn Balls. I pop up one bag of buttered microwave popcorn. After it cools, I empty the bag into a mixing bowl and add 1-9.9 oz bag of M&M’s® Pecan Pie flavored candies. Meanwhile, I melt 1/2 stick of butter over medium and add 1-10 oz bag of mini marshmallows. I reduce the heat to low and stir continuously to melt the marshmallows. I pour the marshmallow mixture over the popcorn and candy and stir to combine. After spraying my hands with baking spray, I quickly form the mixture into balls and allow to cool completely before serving! 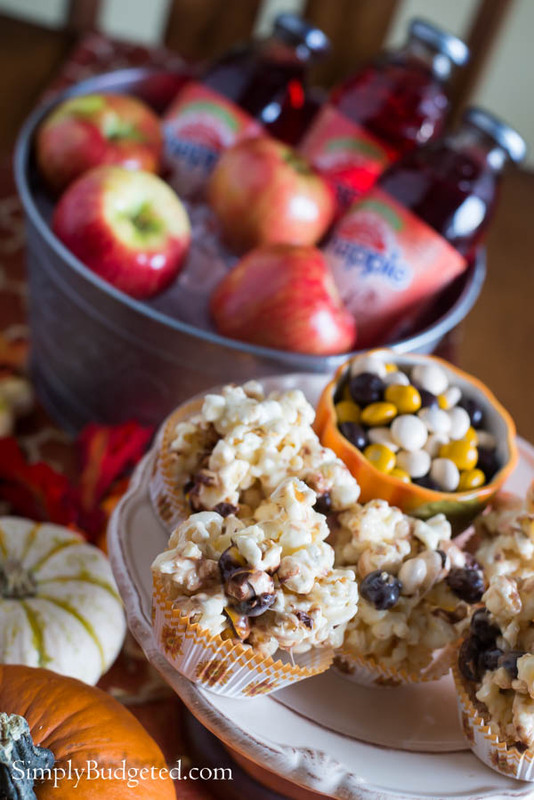 Serve with a Snapple® Apple and you’ve got a pretty complete harvest treat. You don’t even have to bob for the apples!! My next treat is so simple that it’s hard to even call it baking! I simply take a box of Pillsbury™ Moist Supreme® Devil’s Food Cake mix and prepare according to package directions, substituting 1/2 cup of Mott’s® Original Apple Sauce for the 1/2 cup of vegetable oil that is called for. 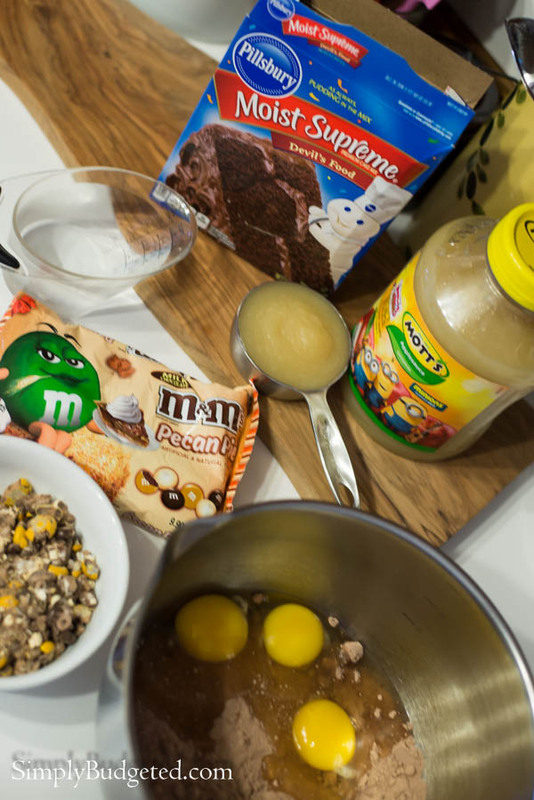 I also crush up and add in 1/2 cup M&M’s® Pecan Pie flavored candies. 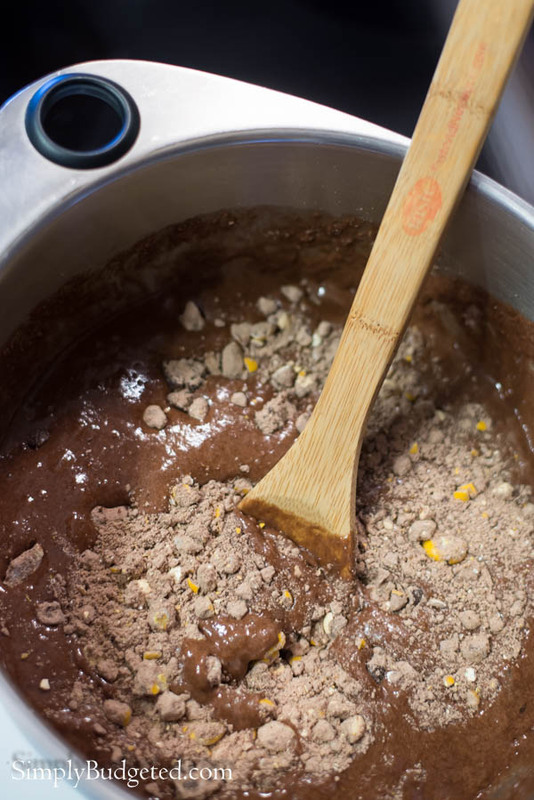 TIP: Coat the crushed candies in a spoonful of the dry cake mix. That way they don’t all fall to the bottom of the cupcakes while they are baking! Top with Pillsbury™ Creamy Supreme® Cream Cheese flavored icing and a M&M’s® Pecan Pie candy and you’ve got a tasty treat that will have your friends thinking that you’ve slaved in the kitchen for them! 1. Preheat oven to 350 degrees. 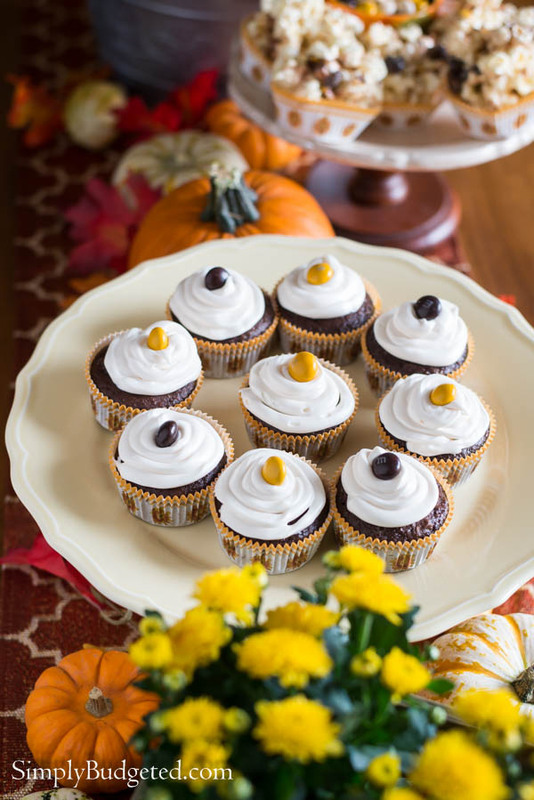 Place cupcake liners into 2-12 count cupcake tins. 2. Reserve 1 Tbsp cake mix in a separate bowl. 3. Combine remaining cake mix, apple sauce, eggs, and water in a large mixing bowl. 4. Crush M&M’s® Pecan Pie candies and coat with reserved cake mix. Stir into cake mix. 5. Divide cake mix between 24 cupcake liners. Bake for 19-24 minutes. 6. Remove from oven allow to cool. 7. Top with icing and garnish with M&M’s® Pecan Pie candies. The greatest thing about this entire party set up is that we got everything except for the cake plates at our local Walmart and with this coupon, you can even save a little coin while you’re at it! 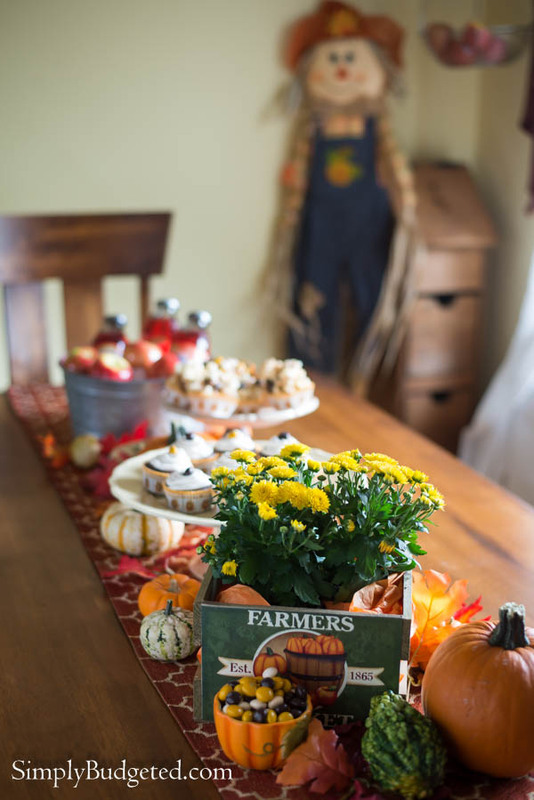 What are your tips for arranging the best Fall Harvest Tablescapes? Leave a comment and share your tips with everyone! I am decorating impaired and you just made creating a tablescape make sense (after decades of not getting it)! Really. Thanks so much! 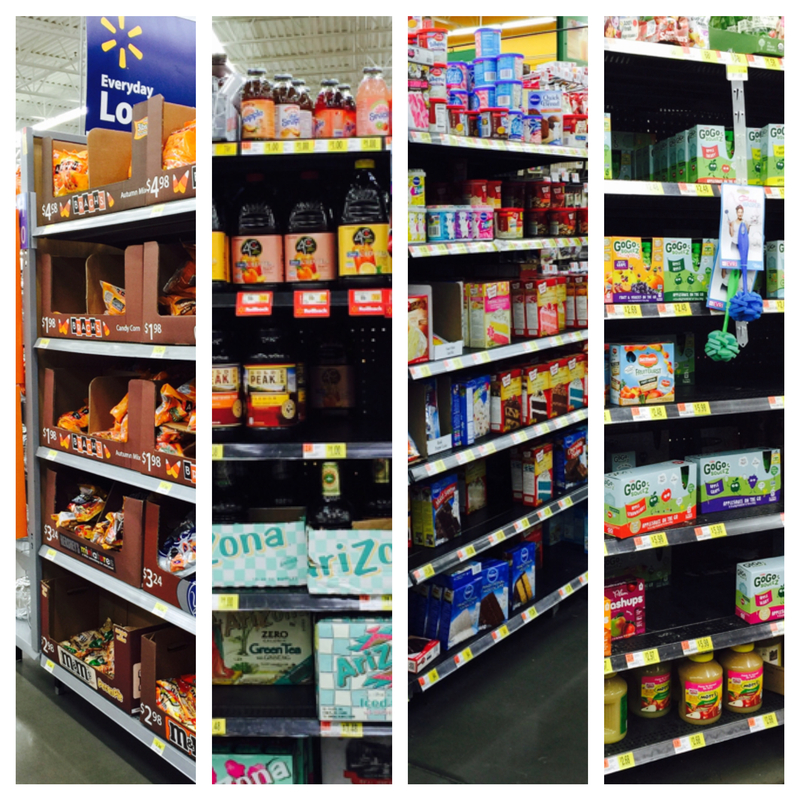 Just like organizing, right? Break it down and make it simple! Thanks so much for stopping by.